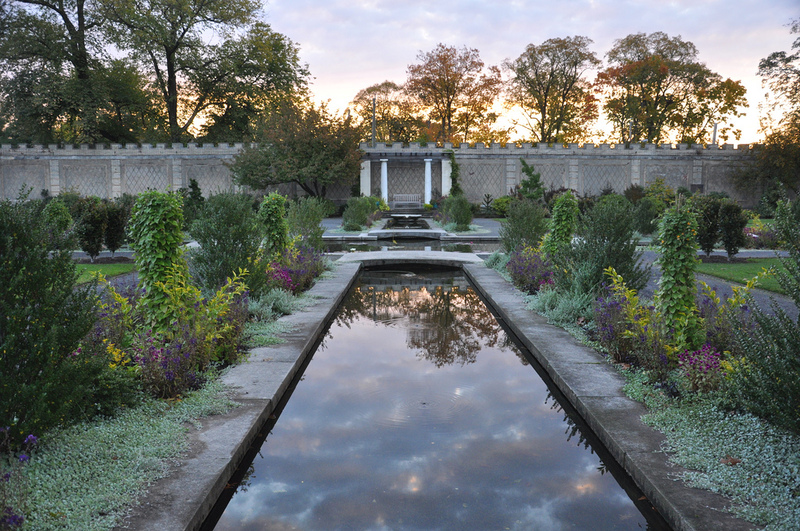 The Walled Garden owes its inspiration to the great Indo-Persian gardens of antiquity. Like the ancient gardens, the Walled Garden is divided into quadrants by waterways and bordered by crenellated walls anchored by octagonal towers. 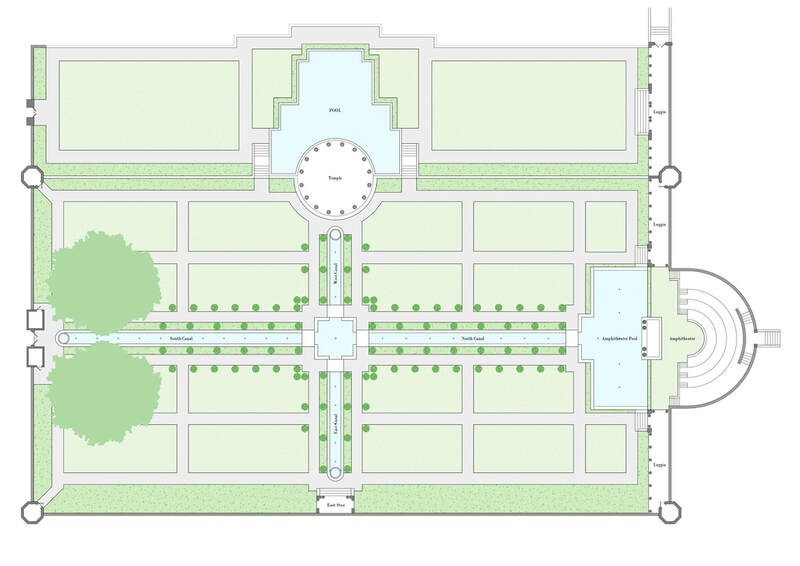 The Indo-Persian walled garden was intended to mimic a paradise on earth and thus had features inspired by religious descriptions of paradise. Biblical descriptions of Eden include four rivers (Pison, Gihon, Tigris and the Euphrates) and two great trees (the Tree of Life and the Tree of the Knowledge of Good and Evil). Islam describes paradise, or Jannah, and includes similar elements: four rivers of life (water, milk, honey and wine), and the Tree of Life. The word 'Paradise' itself comes from the Persian words 'Pairi' and 'Diz' meaning, respectively, 'Around' and 'To create (a wall)'. 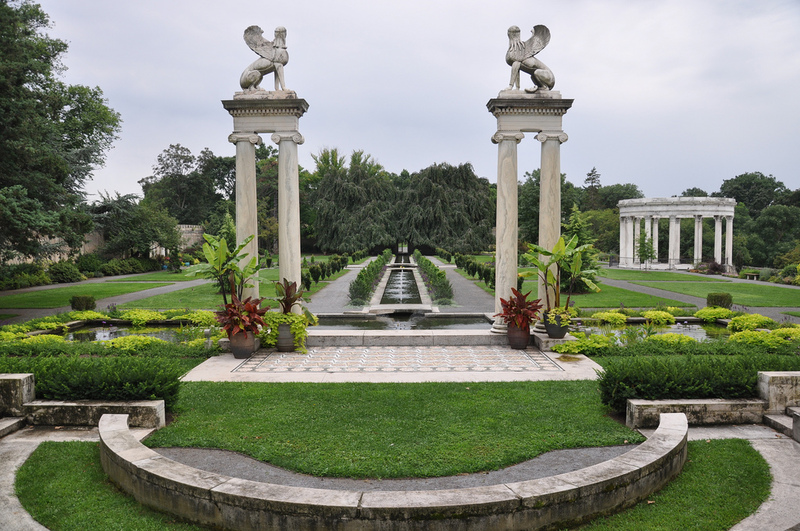 While the concept was Indo-Persian, the gardens at Greystone were appointed with Greek-inspired elements including the Temple of the Sky, a roofless circle of Corinthian columns topped by an entablature festooned with a classic palmette and anthemion design, the open air amphitheater where guests could be entertained by dancers, musicians or poetry, and the stoa where one could relax. In addition to the classical elements, William Welles Bosworth constructed at least two Mycenaean features: the great gate leading into the garden and the mosaic tiled stage of the open air amphitheater. The gate was based on the Lion Gate of Mycenaea (13th Century BCE) which featured an enormous lintel, corbelled masonry arches and a relieving triangular space, filled, in the case of the ancient gate, with a relief sculpture of two lions. The Bosworth version lacks the lions but retains the feel of ancient history. The mosaic floor of the amphitheater was based on a wall fresco found in the ancient city of Tiryns. The fresco, thought to date from 1400-1200 BCE, depicts spirals and papyrus lotus blossoms. Running along the four waterways of the Walled Garden are annual beds punctuated by Japanese hollies. In the spring, these beds are heavily planted with colorful tulips while in the summer and fall bright annuals take their place. 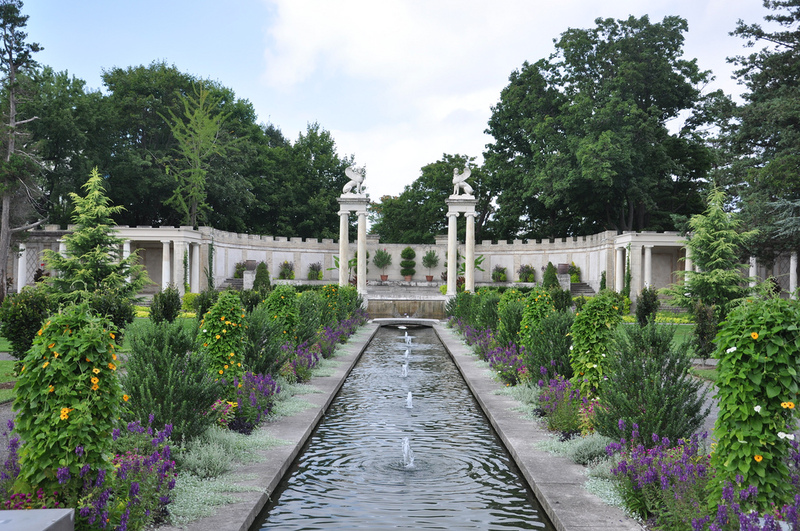 These displays change from year to year as they would have in Untermyer's time. On the other side of the pathways bracketing the waterways are fastigiate (columnar) beeches under which naturalizing bulbs have been planted. The east border focuses on shade- and partial shade-loving perennials including some marginally hardy specimens. The walls of the garden help to protect plants grown near them allowing the growth of plants usually found further south. The stoa at the middle of the eastern border hosts potted tropical specimens and comfortable benches. The west border is home to mainly sun-loving perennials and includes the roses traditional to Indo-Persian gardens in addition to many other perennials, shrubs, bushes, vines and some small trees. Enjoy the varied textures, shapes and colors of this border. The south border, spanning both sides of the great gate is home to another series of fastigiate (columnar) trees: two tiny groves of sweet gums. The south border has plants mainly suited to dry shade as the two weeping beeches and the katsura absorb much of the rainwater in that area. The north border, flanking the amphitheater is sunny and contains simple hedges. The large reflecting pool below the amphitheater is dotted with tropical water lilies and other aquatic plants. Goldfish and koi enjoy hiding near these plants. 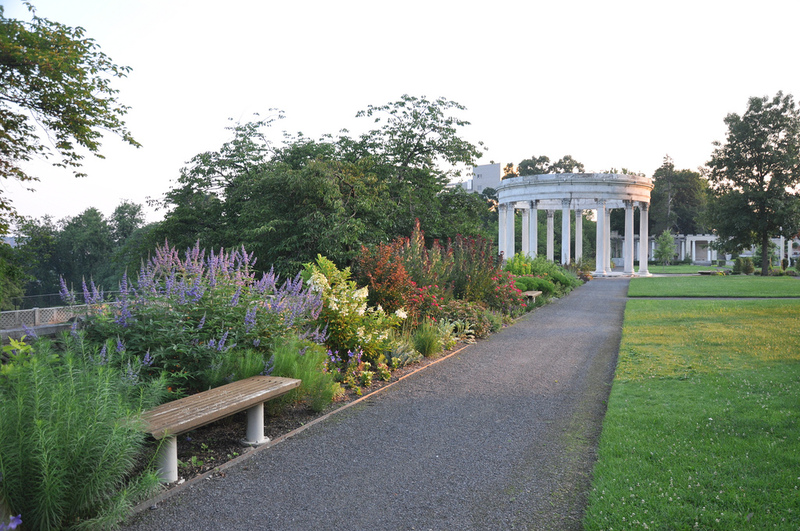 The annual borders of the Walled Garden are continued in the amphitheater area. Container plantings enliven the curved wall behind the seating area. The lower terrace contains a mosaic lined reflecting pool. The mosaic design of swirls and circles contains fish and other sea creatures including star fish, lobsters, and crabs inspired by ancient Roman designs. Restored in the 1970s by Italian craftsmen, the mosaics are currently in disrepair. The eastern hydrangea border in the lower terrace is a work in progress with a collection of more than thirty varieties of hydrangea along with other perennials begun in the spring of 2014. The trees in the lawn are flowering cherry trees that carpet the lawns with pink blossoms in the spring. 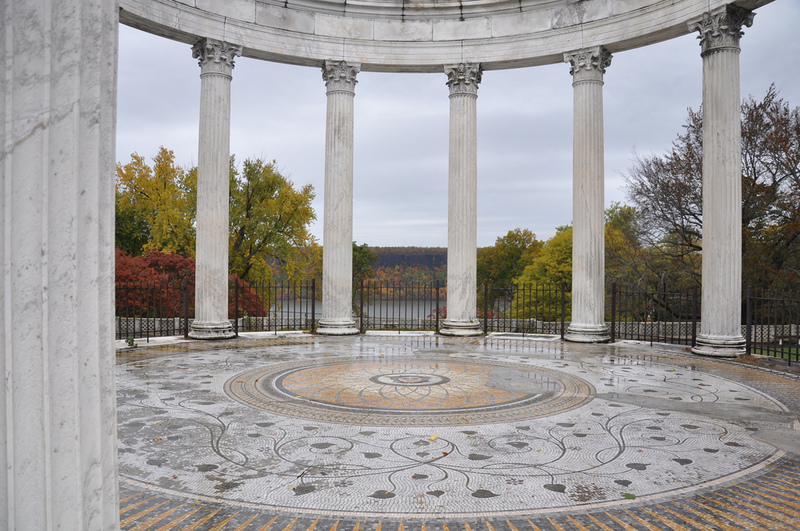 This terrace was the site for performances by the Isadora Duncan dancers with the audience seated and standing in the loggia at the north end. In the fall of 2014, a collection of lilacs was planted below the fence of the lower terrace. This work in progress will be added to over the coming years.